The 'uplifted arms' pose, manifesting the divine and intermediating between heaven and earth. The pose is also called the 'hurray-pose'. This pose indicates the triumphal witnessing and ecstatic seeing of the divine. 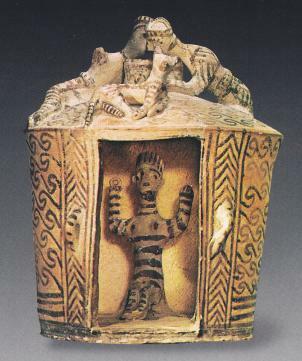 The great Goddess of Crete in her cave temple or niche with uplifted arms in hurray-pose, temple model from Archanes in Crete (1100-1000 BC). "What is my purpose?" I ask myself. "To find a voice," I respond. as my arms lift overhead. The throat chakra is ignited. My hands tingle with vibration. I see the aura around the moon change to dark blue. I feel energy simultaneously coming and going through my palms, lifting my spirit. Upon commencement, I stretch up farther then release my hands down. Grounding once again. I become aware of my place as a teacher of feminist arts-based inquiry this semester. I am holding/supporting the students as they reach toward integrating their own cosmology of living inquiry through spirit, art and wisdom. I feel ready for the task of stepping into the unknown alongside them. And I have my front yard divine mediator ever present for me to come to as an adorant to receive its cosmic energies. A cold clear night for the full moon. An hour after moon rise Megan and I stand at the kitchen window in our adorant MA pose in front of the bright full moon. The moon has reached the top of the barren tree branches of the backyard oak tree. I have a headache this evening and the moon light is too intense for me to look into beyond a few seconds at a time. I can feel and see the brightness through my closed eyelids. I allow the moonlight to bathe over my body as I work to relax into the pose. I keep my arms close to my sides today with my palms out and open to receive. It feels like this moon bath will take time to move through my body, assisting the release of the pain I am carrying. Which I know is caused by carrying too much. of the full moon in her pose in front of the window. 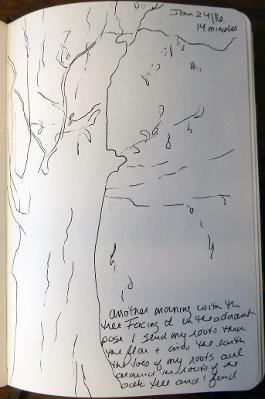 Another morning with the tree in the standing adorant pose I send my roots through the floor and into the earth. The toes of my roots move toward the oak tree roots and curl around them. I am intertwined with this great tree below ground. I breathe deeply and receive the energy from this intermediary of cosmos energy. 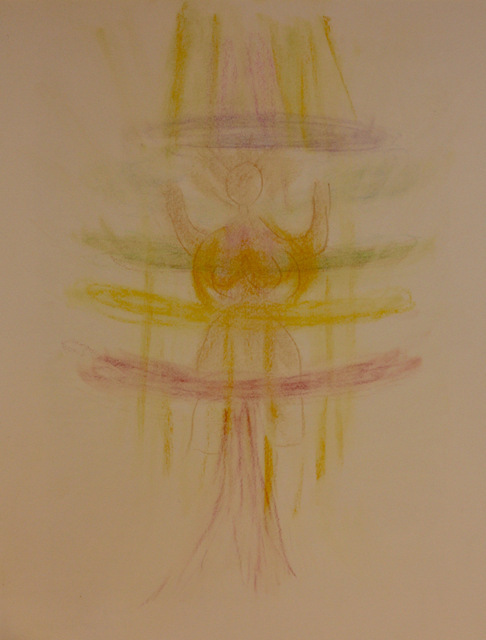 I draw that energy through the root connections and into my limbs, pelvis, torso, arms and head. I exhale and send my energy back down towards its roots and into the tree. I then inhale and draw its energy back into my body. I continue this exchange for a number ofbreath cycles. This back and forth feels akin to the squirrels who spend part of their day climbing up and then down the tree. Traversing the many limbs of the tree without tiring. I am not as energetic and this traveling back and forth requires effort on my part and I begin to moan with my jaw dropped and open AHHHHhh. I expel the sound that ends in a soft breath that sounds like the winds blowing through the dry leaves still attached to the tree branches. My body now begins to shake and tremble. My feet remain solid and rooted as my entire body vibrates with the energy dispersing throughout it. As my body comes to a place of outward stillness, my inner body tingles and vibrates. A peace floods over me as the pose ends. I began the pose after a Sufi practice known as Wazifa. The particular Wazifa I chose 'Ya sami, Ya basir' has the meaning ‘O though the all hearing, O thou the all seeing’, and the quality of clarity and inner seeing. My pose seemed to flow seemlessly from the Wazifa. This practice took place in my home space. At the beginning I stood knees slightly bent, feet a little apart, upper arms out to the side, elbows bent forearms up to the all above. I was initially concerned about how long I would be able to hold the pose as it felt challenging to my body. After a little while I felt my chest rising and my heart soften opening. Body swaying gently side to side. By now my concern about comfort had melted away as my arms felt held in their upward pose, drawn into the all above. Shortly my arms came down to a pose that is more usual for me, upper arms gently held out from my sides, elbows bent with forearms facing forward and slightly upwards and palms facing the all above. After a little while my arms floated up again into the original pose and a spontaneous humming began in me. Breathing through my nose with mouth closed the humming reverberated through my chest and spread out through my whole body. I was lifted up to the divine in adoration. It seemed the song in me was a song of devotion and love. The song continued for some time and when it fell away my arms dropped slowly coming down into a pose of gratitude. Upper arms resting gently at my sides, elbows bent, forearms facing forward hands together left on right palms up slowly floating up to my heart. Deep peace, grace, fluidity, warmth. arms raised in pose how long could I hold this? I have been spending a lot of time at the estuary. I have a project birthing in me around this place and am deepening my relationship with these sacred lands. This visit to the estuary was to experiment with sounding and filming. 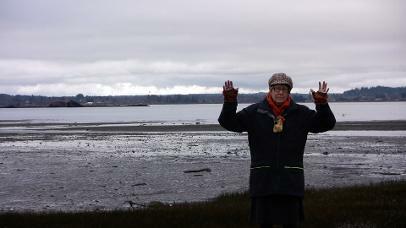 As I moved through the sound I found myself unexpectedly in the uplifted arms invocation of the MA pose which felt absolutely appropriate as a devotion to the divine in this place of unceded territory of the K’ómoks Nation. As I was starting the pose in my bedroom, Shanti got a severe nosebleed when she was getting ready for bed. So my focus went to her, stopping the blood with nose-pinching, ice, and rest. This took a long time, and was a worry as it wasn’t stopping easily. Chris took over taking care of her, which was good. We have been dealing with rounds of the flu in our household, so noses are sensitive right now. I realize how tiring it can be when others are sick around me, with the pull of needed attention. I also think of all the years I have put into nursing both myself and others back to health, how to hold perspective (or what is the perspective) in the midst of illness. Something about doing this MA pose cut through my worries quiet quickly, and opened my energy to flow more easily. I was able to begin the pose again, first in the bedroom, holding it for a minute. In my stress, I could feel an immediate grounding of my own and the household energy, which I asked for assistance with. I realized how this is my favorite pose in the MA cycle, having held it before with Barbara in Paris, and at Chartres cathedral. It’s very powerful and important for me to hold this pose. My belly takes in breath deeply, and I can easily ground my body like this. It’s magnetic how it works, clearing and opening the body and energy system. I could feel my chest opening, an area I hold tension in, giving more space, allowing me to expand and take up space with power and grace. I also held the pose for a long time downstairs in our living room, after Shanti’s nosebleed subsided. The lights were off, and moonlight was flooding into our living space. I loved this connection with the outside in full moon-light. I wanted to hold the pose outside on our balcony, by greeting the moon, but decided to stay in. I had the sense it would be good to clear our home energetically, a practice I hadn’t done for a while. As well, I brought back my own energy to myself. 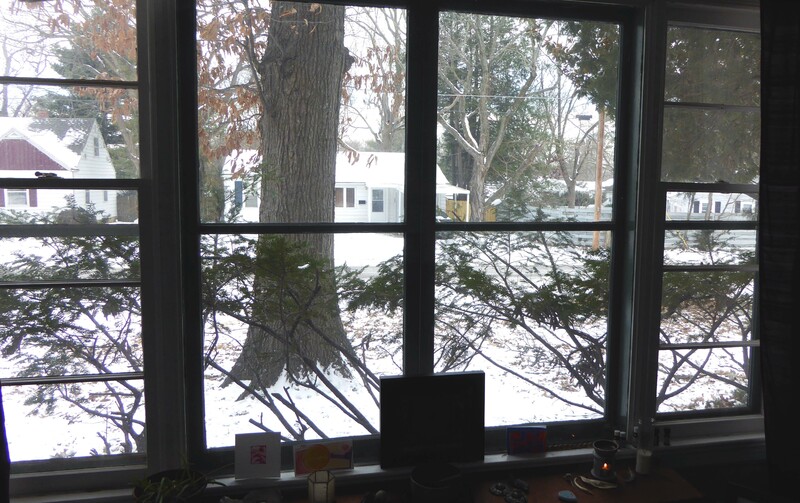 After the clearing and centering, I blessed the space, our home, as sacred, by sending out blessings from my upraised hands and open body, into the cradle of rooms that hold us. This feels like a very powerful pose (very magnetic) that allows the human body to express its sacred incarnational commitments, greeting the world with fullness of being—being and becoming ourselves-divine. my arms get heavy as i hold them up so i square them off supporting my elbows against my torso. 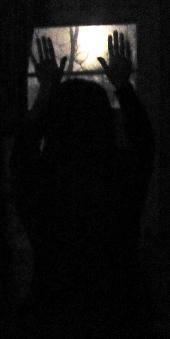 my feet imprint the wooden floor more firmly, knees bent slightly, fingers open, smile creeps across lips. light opens in my chest and radiates through ribcage. a sense of delicate yet firm potency. thought: we’re here to make more light! i sense others standing guard in different places under the same moon. in this quiet house we’re staying four days, i know the sea’s close by down the hill, its body silvered and slivered by moonlight. in the house a picture of wolf moon.